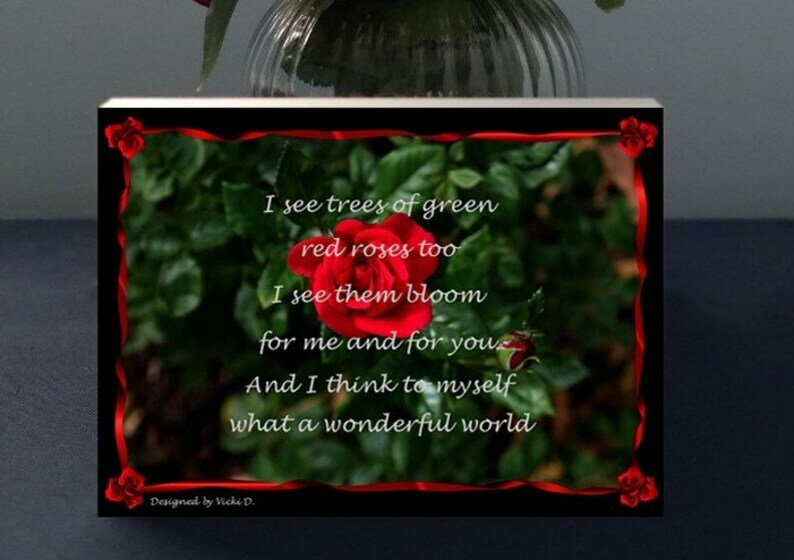 I see trees of green, red roses too, I see them bloom for me and you and I think to myself what a wonderful world.Gift plaques that can stand alone or be hung! ABOUT OUR CREATIVE PROCESS: Each piece is designed personally for you and then professionally mounted by our photo lab partner onto a 3/4 inch premium pressure-sensitive light weight mounting substrate. Our custom gift plaques can stand alone or be hung for a unique standout look. The side of the mounting board is offered in either black or white. Vicki DeCarolis is the creator and designer of our Inspirational Photo Block gift products and they are sold exclusively through Absolute Inspirations Gift Store. For more information on the creation process please refer to the about our Etsy shop section. ABOUT THE PERSONALIZATION PROCESS: When placing your order you will be able to select the color for the edge of your plaque and the size. There is a request a custom item box underneath the product photo where you can let us know of any personalized message you would like us to add onto a card to send along with your gift to recipient. We do appreciate a phone number just in case we need to contact you. REGARDING OUR TURNAROUND TIME: All customized gift orders will be received and processed Monday thru Thursday. All orders received from Friday – Sunday will begin to go through the creation process on Monday. These are designed for you and it usually takes 2 - 3 business days to completely create a gift and ship it out on your behalf once we have received your order. If you have any questions please call us at 302 892 2572 to discuss or start a conversation with us on Etsy. Thank you for visiting and for allowing us to create this meaningful gift on your behalf.